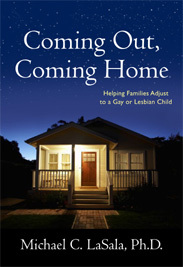 The discovery that a child is lesbian or gay can send shockwaves through a family. A mother will question how she's raised her son; a father will worry that his daughter will experience discrimination. From the child's perspective, gay and lesbian youths fear their families will reject them and that they will lose financial and emotional support. All in all, learning a child is gay challenges long-held views about sexuality and relationships, and the resulting uncertainty can produce feelings of anger, resentment, and concern. Michael LaSala, PhD, LCSW, outlines effective, practice-tested interventions for families in transition. His research reveals surprising outcomes, such as learning that a child is homosexual can improve familial relationships, including father-child relationships, even if a parent initially reacts strongly or negatively to the revelation. By confronting feelings of depression, anxiety, and grief head on, LaSala formulates the best approach for practitioners who hope to reestablish intimacy among family members and preserve family connections—as well as individual autonomy.